On Monday, August 14/27, 2018, the Service of the Lamentations of the Theotokos was held at the Tomb of the Theotokos in Gethsemane. This service is perhaps unique in the Orthodox Church, and preserved by the Typikon of the Church of Jerusalem and Mother of Churches. For this Service, the Hagiotaphite Brotherhood marched down Via Dolorosa, headed by its Hegoumen, His Beatitude and our Father the Patriarch of Jerusalem Theophilos. After arriving at the Hegoumeneion, His Beatitude’s welcome reception took place at the courtyard of the Church of the Dormition of the Theotokos, as the Priests who were dressed in their liturgical vestments chanted the hymns of the Dormition under the lead of the Choir Leader of the Patriarchate Mr. Constantinos Spyropoulos. After the veneration of the Theotokos’ Tomb and the icon of the Theotokos on the south side of the Tomb, His Beatitude put on His Patriarchal vestments, the Archbishops and the Priests did likewise, and having taken the Epitaph of the Theotokos in the middle of the Church the Service of the Lamentations with the 3 stases began. 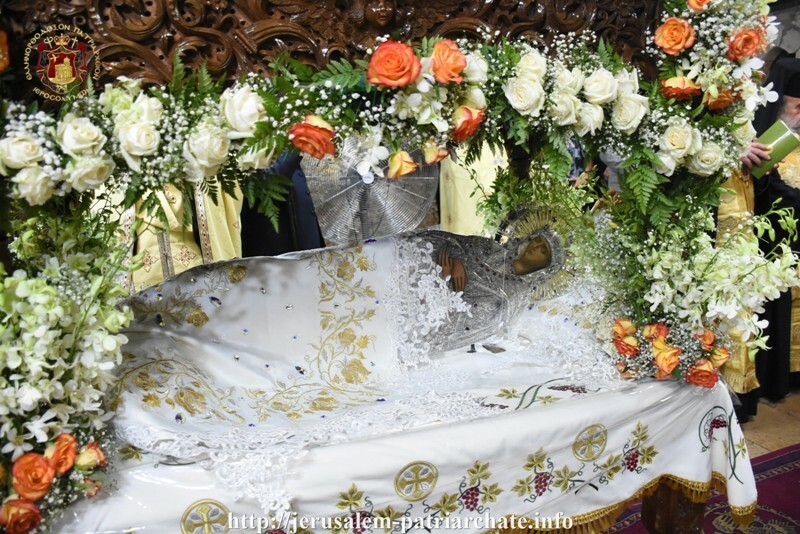 At the end of the Lamentations, the Most Reverend Metropolitan Theologos of Serres delivered a Sermon, then the Eulogitaria, the Praises and the Doxology were chanted and His Beatitude with the Archbishops venerated the Epitaph. The procession of the Epitaph at the entrance of the Church followed, and a special prayer was read. Finally the procession of the Epitaph returned at the south side of the Church, to be followed by veneration and dismissal. The Service was attended by the Consul General of Greece in Jerusalem Mr. Christos Sophianopoulos. Once the Service was over, the Hegoumen Most Reverend Archbishop Dorotheos of Avela offered a reception for the Patriarchal entourage and many faithful at the Hegoumeneion.